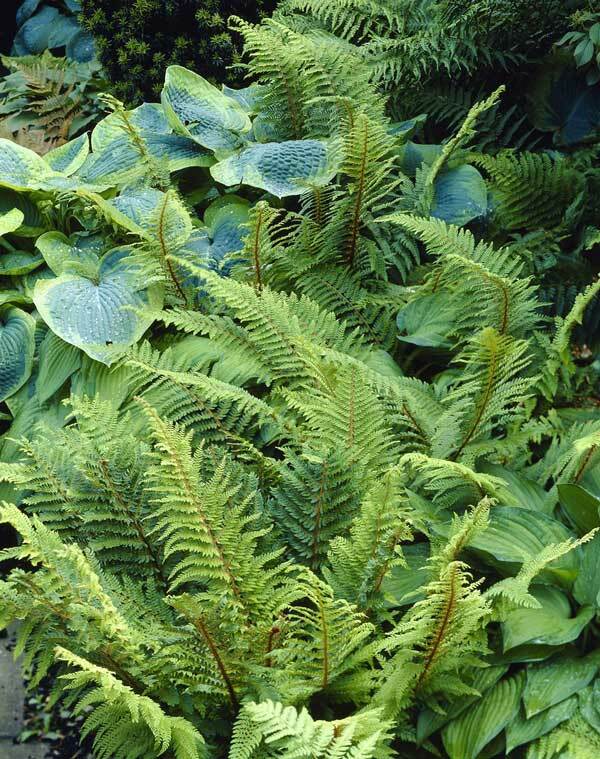 A large genus of gorgeous and obliging ferns, evergreen and many happy in dry shade. 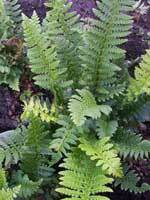 The North American Christmas fern has long evergreen dark green cut fronds, good for cutting at Christmas time. Easy in woodsy type conditions. Evergreen. 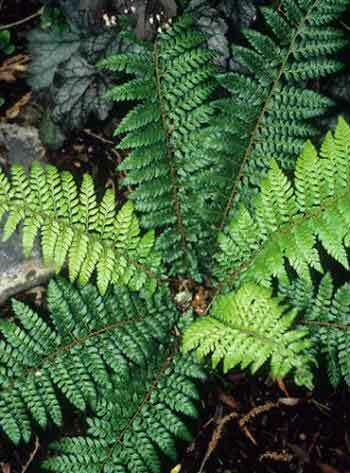 Native hard shield fern with glossy stiff leathery fronds. Tolerant of most soils and happy with some chalk in the soil. Evergreen. 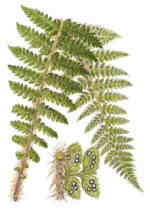 Highly divided glossy fronds. 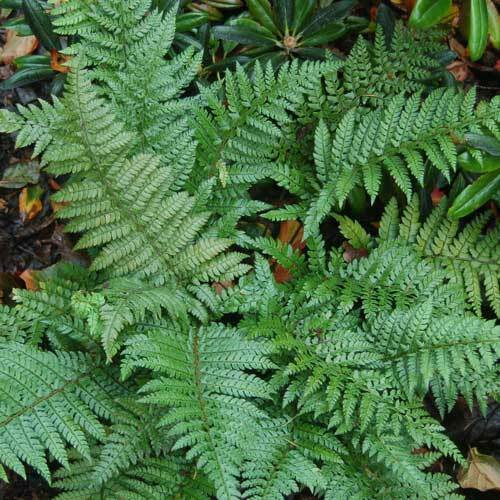 A lovely elegant polystichum. Evergreen. A fine hybrid evergreen and has a good shiny scaled texture to 80cm across and over 1m high eventually. 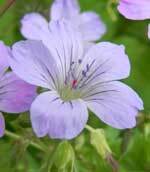 The parentage is said to be proliferum x braunii but I will need to do some more work on this. A very good plant commemorating a great fern grower. 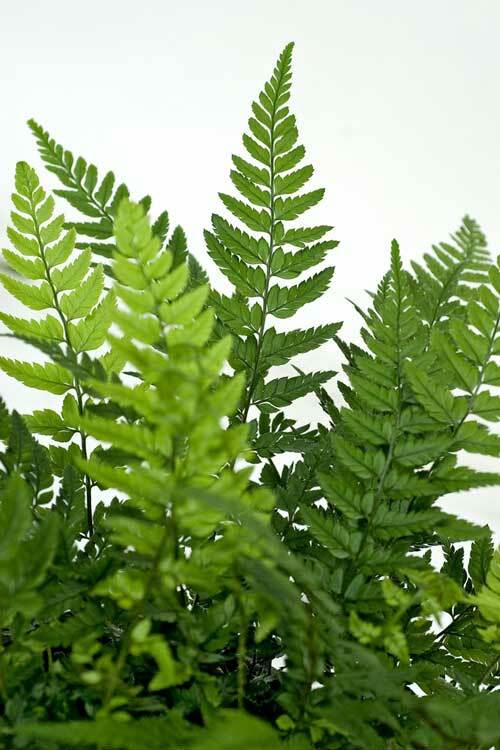 The Asian Saber fern is a super evergreen fern with glossy fronds with a strong upright habit. 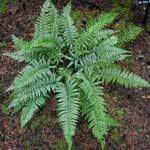 It is one of the most weather resistant ferns we grow shrugging off even snow with little effect. 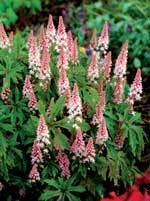 Upright in growth it is eye catching as a single specimen or interesting planted en masse. The Asian saber fern is very drought tolerant once established. Will form a large rosette with prominent reddish gold scales. Handsome and neat 60cm or so across. 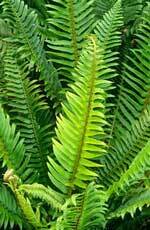 Bipinnate, shiny, glossy, deep green fronds. 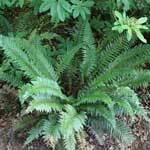 Evergreen, from Asia so not for very dry shade but tolerant once established. A magnificent fern. 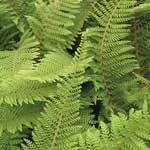 The American sword fern. Well known and long cultivated in this country. Easy and very effective. Evergreen. 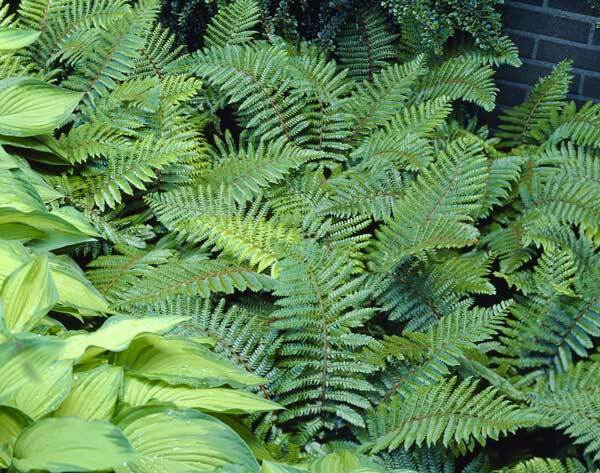 From Korea and Japan, glossy fine cut fronds to 60cm across. Evergreen. One of the finest of the good hardy evergreen ferns. Polyblepharum means 'many eyelashes'. 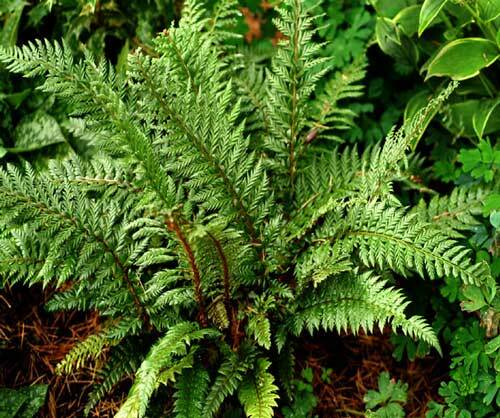 A fine, reliable fern. 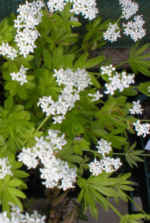 All the setiferum forms will take quite dry shade or sun with a bit more water. 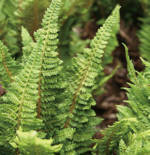 Easy, adaptable and evergreen. 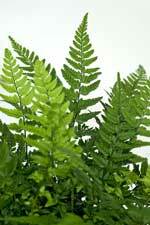 NEW Beautiful low growing fern with stiff scented fronds and stipes of a good length. 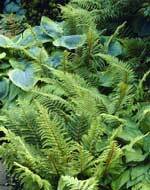 Evergreen and tolerant of some sun if in a damper spot. 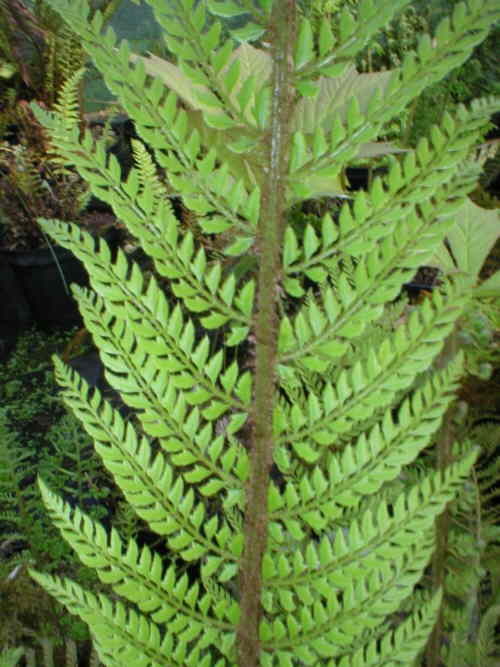 Height at maturity up to 40cm. 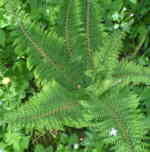 Dwarf variety, congested spiralling fronds with overlapping pinnae. Evergreen. 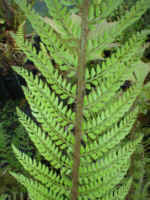 Fronds divided usually quadri-pinnate, an elegant fern. 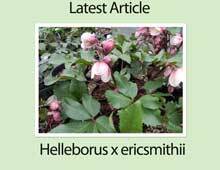 This is a bulbil forming variety of Divisilobum. Long and lacy fronds on this fine form. Evergreen. Good in dry shade. 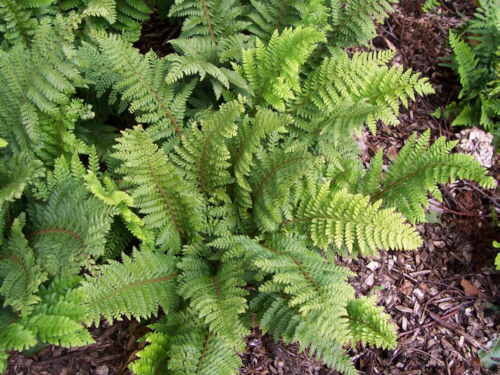 A fine divisilobum form of the soft shield fern. 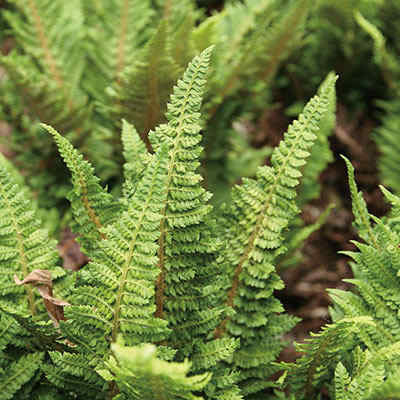 A beautiful, elegant form of this easy very tolerant fern even of dry soils. Makes a very good subject for a container. 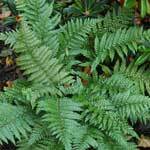 syn Polystichum setiferum 'Plumoso-Densum' A fine medium growing form, with divided pinnae on overlapping pinnules. Very architectual in growth. One of the most popular. More for the shade garden rather than the wild garden. Evergreen. A flat growing form of our native soft shield fern with young plants along the stem. Classic cultivar not possible to produce from spores. 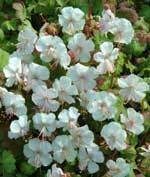 We are thrilled to have 1 litre plants available this year. 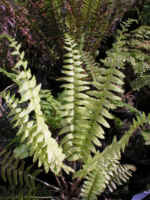 A lovely fern quite similar to neolabatum but a bit more divided shiny dark green frods with a red stem in early season. 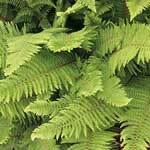 This neat and low growing pale green Oriental fern has holly like tips and a mass of silvery white scales which gives it a striking silvery appearance in the cool dark, shady conditions it loves. Evergreen. The silver sabre fern. 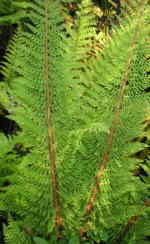 Long glossy fronds with a silver cast to almost black in cold situations. 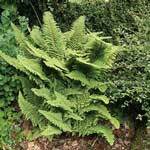 Not for dry shade but lovely for a north wall. Shiny glossy strongly evergreen fronds.